SAN FRANCISCO – Jordan Kunaszyk continued to rake in the honors for his performance Friday as he was selected the Pac-12 Defensive Player of the Week on Monday for the first time in his career. 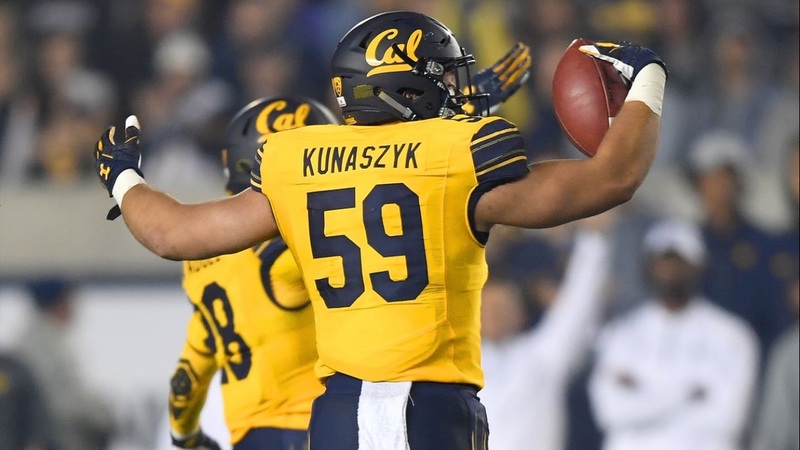 Kunaszyk was also named the Rose Bowl Game Pac-12 Player of the Week and Cal's Muscle Milk Student-Athlete of the Week on Monday following selections as the Walter Camp National and College Sports Madness Pac-12 Defensive Player of the Week on Sunday. The Pac-12 Defensive Player of the Week selection for Kunaszyk marks the third time Cal has had the Pac-12's Defensive Player of the Week in 2017 to equal a school record previously accomplished four times most recently in 2008 (Cameron Jordan, Mike Mohamed, Zack Follett). Devante Downs was previously chosen for his performances in victories at North Carolina and against Ole Miss. Downs is the first Cal defensive player to win the honor twice in the same season since Mohamed in 2009. Kunaszyk led Cal's defensive performance in a 37-3 victory over previously unbeaten No. 8/9 Washington State on Friday to give the Golden Bears their first victory over a top-10 team since a 34-31 triple overtime win over USC in 2003. Kunaszyk established or equaled career highs with 11 tackles, 2.5 sacks (-31 yards), 2.5 tackles for loss (-31 yards), one forced fumble, one interception and one quarterback hurry. Cal forced seven Washington State turnovers and had 9.0 sacks as a team with the sacks tied for the second-most by an FBS squad in 2017 and the most by a Cal team since a 2005 contest at Stanford. Kunaszyk has all 23 of his tackles for the 2017 season over the last three games after previously playing only in Cal's season-opener at North Carolina before missing the next three contests due to injury. He also had an interception in his first game back in action at Oregon that he returned for 53 yards and has two picks on the season to co-lead the team. His 2.5 sacks are second on the team behind only Pac-12 Defensive Player of the Year candidate Devante Downs while his sack and tackle for loss yardage totals (-31) both lead the Golden Bears. Cal (4-3, 1-3 Pac-12) will next host Arizona (4-2, 2-1 Pac-12) at California Memorial Stadium for Homecoming this Saturday, Oct. 21 (5 pm PDT, Pac-12 Networks). Individual game tickets are currently on sale for the remainder of the 2017 Cal football season. For more information, visit CalBears.com/tickets or call (800) GO BEARS (462-3277).